I wrote this on Facebook once, and I thought it was worthy of a blog post. It’s far from perfect. For context, it had been a tough couple of years and I was finally pulling up to the “what now?”. Relish the pain. When it’s over, you’ll miss it. When I look to those days my friends know best, those days where we licked our wounds, and built eachother up over a joint, and we talked about the struggle (Jenn, Lisa, Cody, Tim, Dan and Sean, I love you guys) –my whole life has been one hell of a struggle. And anyone reading this knows their life has been, too. Now I am looking at the prospect of finally being happy. Of “making it” and I am starting to feel the future. And The “Now What?” is beginning to appear. As I write this I am broke, but it won’t last. Choices we’ve made, my wife and I, are beginning to make way to that future we’ve been independently been longing for. 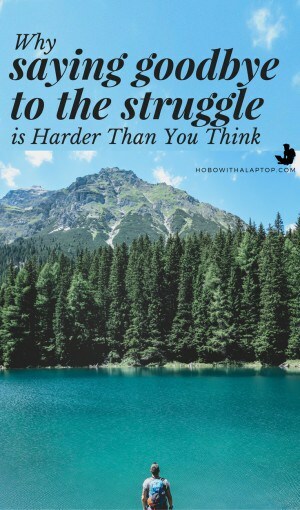 It won’t be some crazy over night success or anything, but the struggle will dissipate. And I now know The Struggle as a lover, a woman, one that I will miss. There’s a point in our lives when everything we did was because of The Struggle. The choices we made, good or bad, our excuses, why we took that job, why we got in that situation or that fight, or why we tried to destroy ourselves. Why we left so much behind to pursue something new. We made great art, we felt things deeply, we enjoyed that plate of rice when we didn’t know where the next one was coming from. We fight against The Struggle every day to show her we’re better than her. We buy things. We take trips. We go for the job we hate just to surpass her. We fight, we fight, we fight. I am looking The Struggle in the eye today, and I am finally saying goodbye. And I gotta’ tell you, I’m sad to see her go. All those memories, all those moments I had because of her. It’s surreal to think what anyone would be like without her. We wouldn’t have Einstein, and we wouldn’t have Jesus’ archetype. We wouldn’t have heroes. Indeed, we owe a lot to The Struggle. She isn’t like any other love, because we didn’t even know it was love. And when we figure that out, she’s already got her suitcase by the door. We can invent other struggles after she’s gone, like self improvement, getting abs, helping a lost cause –and we’ll do it because of a single underlying fact: We miss the Original Struggle. So for those suffering under a tin roof not knowing where their next plate of rice will come from, for those in hapless relationships, or those up late at night, every night, writing on walls trying to formulate a plan –maybe, just maybe, you’re leaving behind the one thing that actually gave you strength. Some people I know are married to her. I have a deeper respect for those people today. But when you do finally make good on those promises, and you do find a way out, know that you’re leaving behind some of the best feelings, the best moments, and the best people you will ever know. Tonight, look her in the eye and tell her you love her. That you’re grateful for everything she’s done for you, and everything you are because of her. Respect The Struggle, and she’ll let you go. What comes after that is uncharted for most of us. As for the “Now What?” –I sincerely doubt she’ll be as beautiful as The Struggle. In fact, I think she’s a more cruel force. We will always, always, always look back on our days with The Struggle and remember them fondly, for what they really were: True happiness. She tested our mettle, she made us our best, and worst selves. If you’re battling with The Struggle, embrace her, make sweet love to her, because one day you will have to say goodbye, and it won’t feel as good as you think it will. Did you like this post? Then I really think you might want to read this one.